...that the booms they are using to try and contain parts of the Gulf Oil Leak are made from hair? No? Niether did I. Until I stumbled upon Rachel's blog. For those of us here in Australia, we know about the leak, and there might be the occasional update on the nightly news, but that's about it. In America it's another story altogether. 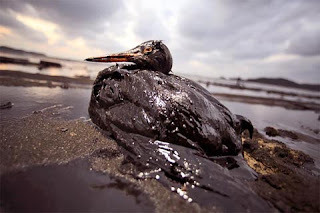 This oil leak is huge news, as well it should be considering the millions of people, not to mention wildlife this horrbile tragedy is affecting. It's really sickening the extent of damage and hardship this has caused and it's easy to feel helpless. I watched a lot of the coverage while I was in the States and it's just devestating on so many levels. There isn't a lot we can do here in Australia (although I'm sure there are places you can donate to the relief effort online, I will be looking into this tonight), but if you live in the States, you may be able to help Matter of Trust. Even though OUR WAREHOUSES ARE FULL and we are concentrating on making and deploying boom right now, ALL salons, groomers, fleece farmers, hairy individuals, & pet owners can sign up to be on our database to recycle hair, fur, fleece, feathers, nylons in future. We do need more volunteers and funding for other supplies (zip ties, crawdad bags, anchor line...) Thank you all for supporting recyling of this renewable and useful fiber! Please be patient for warehouse addresses, we are making boom and clearing space. This Gulf spill will need boom for months, maybe years. If you live in the US you should def try and promote this very worthy cause and get the word out to as many of your local Salons, Pet Groomers, Alpaca, Llama, Sheep Farmers, etc, anyone who has an abundance of hair to spare! Head over here to Matter of Trust to see how you can help out with the Hair for Oil Spills Program and make sure you spread the word. Awesome Mrs.P.....Thank you so much.... not just for writing about this subject but for the shout out. Just as an update I found to salons in my area that knew nothing about this and are now collecting hair and sending out ....fab uh? Hair? I'm amazed that is what they use.